Figurative Language Activity: Idiom, Pun, Hyperbole, Similes, Metaphors, etc. Figurative Language Task Cards: Idiom, Simile, Pun, Metaphor, Hyperbole, etc. 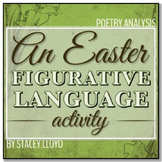 Easter Concrete Poem with Figurative Language and Poetic Devices. Onomatopoeia, simile, metaphor, hyperbole, assonance, consonance, alliteration, personification. This poem is decorated very well but it does not show up in the thumb nail... Trust me it will lokk nice. 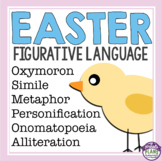 Figurative Language EASTER Egg Hunt! This is a bundle of 6 sets of Easter task cards (216 task cards total) by Pages Of Grace. Individually, these task cards cost $17.50. Save $3.50 by purchsing these task cards as a bundle! 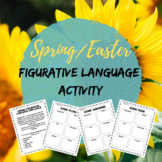 Task cards are great for reviewing and practicing skills, while also incorporating some Easter fun in your day!